UDON OFFERS A DOUBLE DOSE OF STREET FIGHTER™ COMICS THIS MARCH! 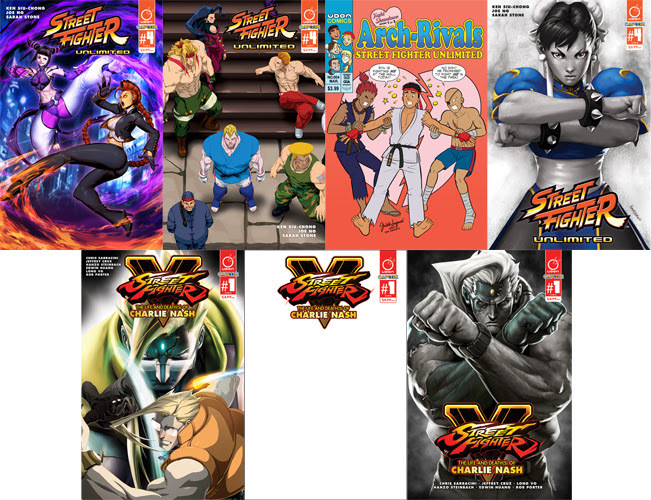 Toronto, ON – JAN 5, 2015 – Hot on the heels of the release of Street Fighter™ V on the PlayStation 4, UDON is bringing two Street Fighter titles to comic shops this March! Now orderable are ‘Street Fighter™ Unlimited #4’, and the special ‘Street Fighter™ V: The Life and Death(s) of Charlie Nash #1’! In Street Fighter Unlimited #4, series writer Ken Siu-chong and artist Joe Ng conclude the first story arc of the ongoing series as Ryu encounters a ghost from his past and Guile, Cammy, Alex, and Chun-Li struggle to survive the onslaught of Vega's new minions. This issue also features a 4-page bonus story illustrated by Sarah Stone (Transformers: Windblade), starring the deadly damsels of S.I.N – Juri VS. Crimson Viper! This issue features two standard covers by Gonzalo “Genzoman” Ordonez Arias and Jeffrey “Chamba” Cruz, as well as two special incentive variants. Gisèle Lagacé (Archie, Ménage à 3) provides the “Arch-Rivals” homage variant, while Steve “Kandoken” Mack provides a Street Fighter™ V variant of the leading lady of fighting games – Chun-li! Also available in March is Street Fighter™ V: The Life and Death(s) of Charlie Nash #1, a 48-page one-shot delving into the past of this recently returned fighter. This oversized special features a cavalcade of UDON creators, including writer Chris Sarracini (Street Fighter Origins: Akuma) and artists Jeffrey Cruz, Hanzo Steinbach, Edwin Huang, Long Vo, and Rob Porter. This title features a standard cover by Jeffrey Cruz, a special Black Sketch variant, and an incentive cover by Steve Mack.